Paper presentation on “Using Parallel and Comparable Corpora in Teaching Chinese-English Sight Translation” at ICLC 7 – UCCTS 3 (7th International Contrastive Linguistics Conference and 3rd Conference on Using Corpora in Contrastive and Translation Studies), held at Ghent University, Belgium, on July 12, 2013. Invited lecture on “Corpus-based Translation Studies and Translation Universals” at the 2013 Summer School of Corpus-based Translation Studies, held at Shanghai Jiao Tong University in Shanghai, China, July 19, 2013. This entry was posted in Faculty and tagged Belgium, china, chinese, faculty, T&I on August 12, 2013 by Joan. This entry was posted in Language Education, News, TFL, Uncategorized and tagged Alumna, chinese, TFL on October 8, 2012 by GSTILE. 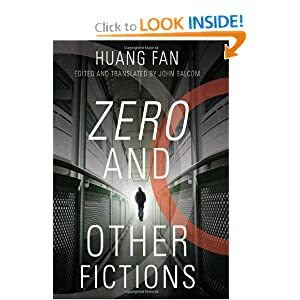 Dr. John Balcom, a professor in the Translation and Interpretation department at the Monterey Institute of International Studies, edited and translated the book entitled “Zero and Other Fictions,” written by Huang Fan. This entry was posted in Uncategorized and tagged china, chinese, faculty, publications, T&I on January 23, 2012 by Jeffrey Fowler. Professor Dai was invited to conduct another 4 CFL Pedagogy (Chinese as a Foreign Language Pedagogy) workshops on Chinese Grammar Pedagogy and Curriculum Design of Content-based Instruction by National Hsinchu University of Education after completing 3 CFL Pedagogy Workshops for them last year. The workshops ran from December up until April, and the last one is scheduled for April 25th. The above is a collaboration of Professor Dai’s workshop title pages from the National Hsinchu University of Education. The top left image is from workshop 1 in early December titled “Learning environments and Chinese programs in the U.S.”, the top right image is from workshop 2 in late December titled “Life, Cognition and CFL Pedagogy (Teaching Chinese)”, the bottom left image is from workshop 3 in January titled “Blogging Language Education in the Virtual Environment”, and the bottom right image is from workshops 4 and 5 in March titled “Chinese Grammar Pedagogy: An Introduction and Practicum”. She was also invited to join a team of teacher training STARTALK program and will teach for a 2-week intensive STARTALK Program for non-native teachers of Chinese this summer at ACC/ Hamilton College. In addition to the workshop invitation (National Hsinchu University and Education) and StarTalk Teacher-Training Program (Hamilton College), Professor Dai was invited to give a 2-hour talk on CFL Pedagogy on April 19th at the National Pingtong University of Education. Participants in Professor Dai’s workshop are able to view her PPTs via GoogleDoc sharing. This entry was posted in Language Education, Language Studies and tagged china, chinese, faculty, languages, TESOL-TFL, TFL, workshops on March 14, 2011 by GSTILE. The Monterey Institute is renowned for our special Monterey Model courses, which are taught simultaneously in multiple language sections. The Language Studies program offers professionally-relevant language courses for our students pursuing degrees in policy and business. These sections may focus on a topic such as Challenges of Globalization, Issues in the European Union, or Green Business (to name just a few), which each group explores from their own language and cultural perspective during the semester. These language courses, some of which are offered in our Monterey Model format, provide opportunities for our students to enhance their language skills while exploring topics relevant to their degrees. At one or two points during the semester, all languages meet in plenary sessions (interpreted by students in our Conference Interpretation program) to share their findings. Professor Jinhuei Enya Dai, Professor Vicki Porras and Professor Jacolyn Harmer initiated the 1st Mini-Monterey Model Event back in the Spring semester of 2007, which was entitled “Business Culture Presentation” presemted in Spanish and in Chinese, and collaborated with the Translation and Interpretation Program. Later Japanese Professor Naoko Matsuo and Spanish Professor Pablo Oliva also joined the Mini-Monterey Model events in 2009. Currently, as of Spring 2010, we are celebrating the 7th Mini-Monterey Model Semester. tremendous value of enhancing language learning at the institute and to academic life at MIIS. The 7th Mini-Monterey Model, held on April 23th, 2010, was a collaboration between the Translation and Interpretation Program, the Chinese Studies Program and the Spanish Studies Program. The topics ranged from China Nuclear Doctrine, Provincial Reconstruction Team, Renewable Energy, Waste Management, to Chinese Pedagogical Grammar. This Model provides and enhances learning opportunities for T & I students and Language Studies students from different majors and expertise. It also showcases the outcomes of MIIS’s signature pedagogy in Language Studies Program: Content-based Instruction and Individualization. We will continue celebrating Mini-Monterey Model and hope you can join us soon! This entry was posted in Events, Interpretation, Language Education, Language Studies, Translation, Uncategorized and tagged chinese, current students, GSTILE, Interpretation, Language Studies, languages, Monterey Model, spanish on April 26, 2010 by GSTILE. This paper addressed the design and implementation of business curriculum for a special purpose: environmental protection in China. To integrate technological use in the language classroom, “Green business in China” advocates the use of blogging, GoogleDoc, Moodle, Youtube and others as part of Chinese language instruction. Moreover, to broaden the influence of “Green Impact”, this course has an unique multilingual component in sharing the blogging site with Spanish Program’s “Green Business in Latin America.” Learners in both classes can not only learn the language but also learn the content through the weekly blogging site. In addition to blogging, this course may be tailored to the learners’ needs by integrating individualization and innovative approaches to encourage learners to further their interest in environmental protection and green business using Chinese language. This entry was posted in Language Education, Language Studies, Uncategorized and tagged blogging, chinese, green business, individualized, language, multilingual on March 26, 2010 by GSTILE.